Besides being a huge Mead fan, I picked up this book because the premise seemed freaking fantastic. In this, at least, I wasn’t disappointed. Mead has created a huge world with a diverse population–did I mention huge? This book travels like nobody’s business. The very idea that the Republic of United North America is cracking down on religions, or as they say “belief in fictitious entities,” is really cool–especially because it’s obvious right from the get go that there are some larger forces at work. The involvement of the various gods–and especially Justin’s ravens–kept me engaged in this book even when everything else wanted to through me out. This book is told from multiple points of view, mostly Justin and Mae’s. The story is told in the third person, yes, but there still never felt like there was much of a difference between their narrations. The characters themselves came off as a little flat, which was strange because so much time was spent investigating what made them tick. Mead was very thorough in giving background on her characters, and all of them had multiple facets that I enjoyed. But there was still something that kept them from lifting off the page for me, a kind of stiffness that I can’t explain. It was quite strange. The plot and pacing of the book also seemed to drag on a little. Mead, as usual, is all about plots and subplots, but I wasn’t as invested in some of them as I could be. Perhaps it is because some where mentioned in the book but then not really addressed. The character of Tessa bothered me especially, because I didn’t understand the point of watching this girl from the provinces adjust to life at high school while Justin and Mae were out playing with gods and murderers. Most times she just seemed like a human plot device, whose actions only facilitated certain events that needed to happen. Overall, however, I think this was a successful book. I might have gotten bored in places, but I always kept reading. The intrigue with the multiple deities running around kept me hooked, and will keep me hooked for the next book. I would recommend this book for people captivated by the world Mead is creating. It’s not one I’d urge you to buy in hardcover (especially because it’s an adult book and gollywhiz those prices for hardcovers), but if you see it in paperback or at the library and think it might be interesting, I’d be all over that. 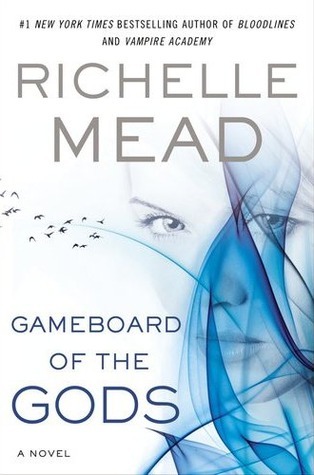 I haven’t read any of Mead’s books, but LOVE the premise of this one! I was very pouty when I got denied it on NetGalley, but I’m still super anxious about it! While I don’t typically read adult books, this one is gonna be an exception! Sorry you got declined! The idea behind this one is SO COOL. I love it just for that! It’s out in the world now, thank goodness. Perhaps a first person narration would have helped?